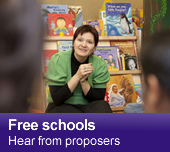 The Department for Education is responsible for education and children’s services. 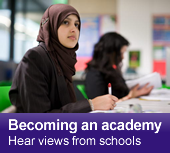 Find out about the academies programme which provides schools with greater freedoms to innovate and raise standards. Nick Gibb: Improvement welcome – but more needs to be done. The Department has today published the annual school exclusion statistics. The Department for Education launches a consultation on proposed changes to the contribution rate for employees in the Teachers’ Pension Scheme. The independent Teachers' Standards Review Group is now considering the higher level standards for teachers. The closing date to respond to the call for evidence is 5pm on Friday 9 September. View, download and order departmental publications. All statutory guidance and legislation linked to from this site continues to reflect the current legal position unless indicated otherwise, but may not reflect Government policy.